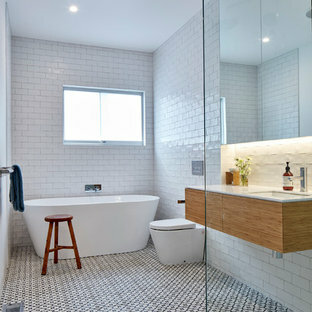 If you’re looking for bathroom ideas, look no further than Houzz. Our image gallery brings you a large range of photos with inspiration for your viewing pleasure, and not only that - you can also save your ideas in ideabooks and find the professional that has done the job. 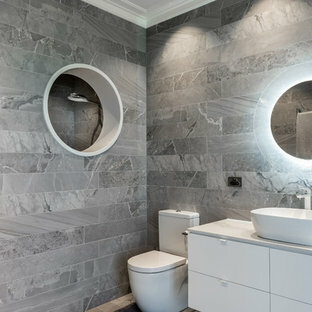 When planning your bathroom design or update, start by collecting images of designs you like and take it from there. 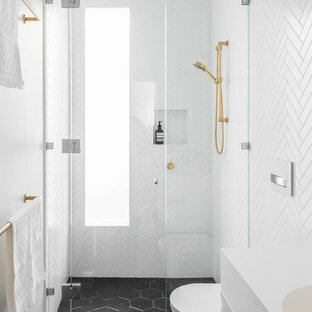 Whether you are designing your bathroom from scratch, redesigning, updating or simply decorating, you’ll be sure to find ideas for every possible scenario. And once you're ready, you can find the architect and/or builder to get the job done. 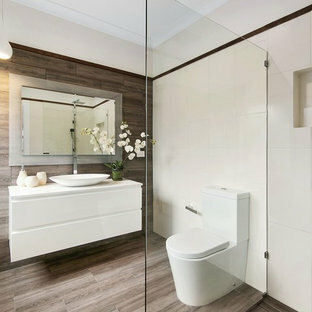 But let’s start with the bathroom design basics. 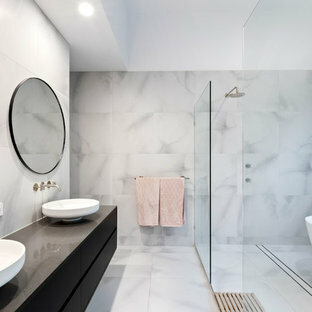 A good bathroom design brings together beauty and functionality. It reflects your personality in its style, colours, fittings and fixtures, but serves your needs to a tee both when you’re getting ready for work in the morning and when you want to wind down in your bathtub after a long day. Firstly, consider your space. Is it rectangular or are you working with a long, narrow room? This will determine how many wet walls you can accommodate, and if a bathtub can fit. 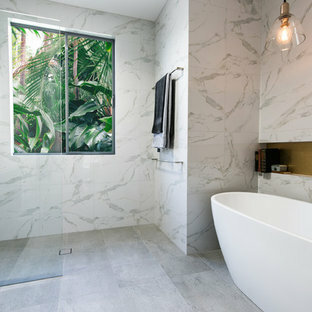 For example, in a narrow room a freestanding bathtub may not work, and a one-wall layout that lines up shower, toilet and vanity on the same wall will make sense in most cases. (It’s also the most budget-friendly option in terms of plumbing). Maybe separate rooms for toilet and shower make sense? Maybe you want to work with a window above a bathtub or in the shower. You may live in an old house where you can keep some of the original character of the home, or you may be working with a small apartment space. All these considerations are vital in deciding on which layout will work best for you. Have a look at some popular ideas to get started. Once you’ve gathered some inspiration, have a think about who is using the room, and how they will be using it. A single guy needs a lot less storage than a teenage girl, and a family bathroom may need to consider elderly family members. Making your bathroom wheelchair accessible could save you thousands down the line. You may also want to accommodate a washer and dryer in the bathroom, since it’s where clothes are taken off frequently. Also consider safety and cleaning. 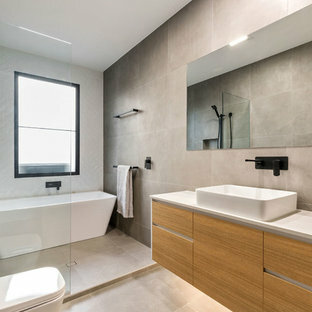 Ensure no-one will slip and hurt themselves, and consider that many little tiles will make for many little nooks for grime to accumulate, whereas big surfaces like a sink that is integrated with the vanity counter, or a big mirror will make wiping down the surface much easier than having sinks sitting on top or an intricately designed mirror. Are you going to tile floors and walls? There’s so many possibilities, from your choice of tile to how they are laid. If you’re budget conscious, you may want to consider a wallpaper or paint for certain areas. A simple grey tile can make room for other elements to shine, while mosaics or a subway tile can make a great feature wall. Lighting doesn’t only look pretty, but can impact your bathroom experience significantly. The mirror is a special area you want to light well, so that you don’t miss any hair when shaving or can apply that perfect line to your eye. Pay attention to how colours of cabinets and floor can impact a room. You may want to consider a wooden floor for something different and pair it with simple white vanity and cabinets, or you may want to go for the steampunk look with bronze tubes and black walls. Consider what type of shower, bathtub (if any), toilet, sink and vanity you want. Maybe you have space for a generous spa with walk-in shower, or maybe you want a freestanding bath to be the feature of the room. 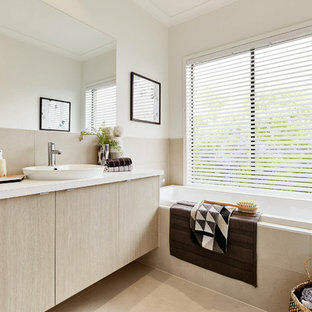 Bathroom as displayed at Woodlea Estate, Rockbank.